Want to buy a bitcoin? Mt. 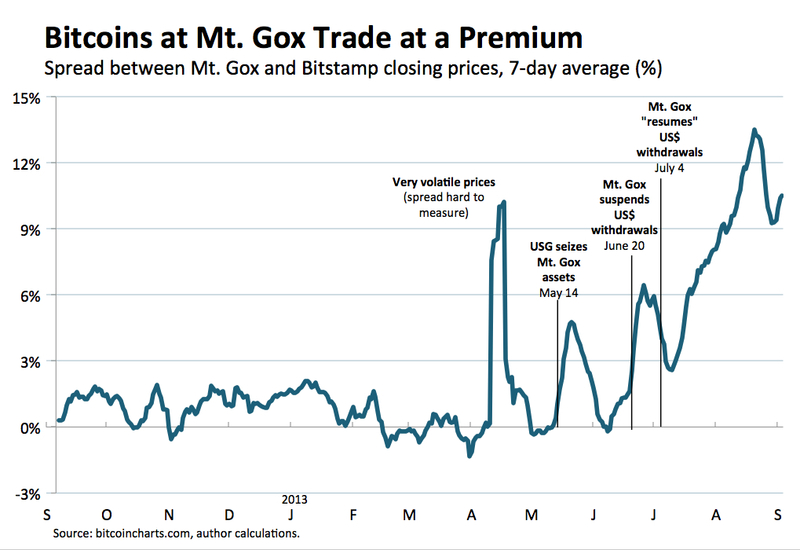 Gox traders are thus paying a 12% premium for their bitcoins. That spread seems to violate a fundamental economic law. 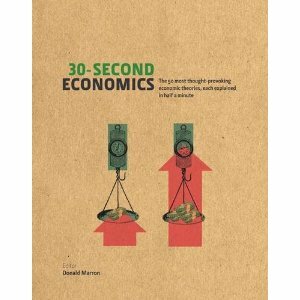 When transaction costs are low, identical items should trade at nearly identical prices. Otherwise, arbitrageurs would step in to buy cheap and sell dear until the price gap narrows. In April, however, the bitcoin market went haywire. After spiking to $266 on Mt. Gox, bitcoin prices cratered, falling as low as $54 just two days later. That volatility created large, but temporary spreads between prices on different exchanges (and made it difficult to measure spreads accurately). When conditions calmed, spreads returned to normal. And then Mt. Gox’s troubles began. On May 14 the U.S. government accused the exchange of operating an illegal money service business. The government seized $5 million that Mt. Gox held at Dwolla (an online payment processor) and Wells Fargo. Fearing for their money, Mt. Gox customers converted their at-risk dollars into easy-to-withdraw bitcoins, and the Mt. Gox-Bitstamp spread spiked to 5%. Spreads briefly normalized until Mt. Gox announced that it was suspending U.S. dollar withdrawals. Mt. Gox had become a Roach Motel (or, if you prefer, a Hotel California) for U.S. dollars. Traders could check their dollars in, but they couldn’t check them out. Customers responded as you would expect. The spread spiked to 6%, as Mt. Gox traders again converted dollars into bitcoins. The spread briefly narrowed after Mt. Gox’s July 4 announcement of resumed dollar withdrawals. But spreads then spiked to record levels once Mt. Gox customers started reporting that withdrawals remained slow or nonexistent. Mt. Gox prices are higher than on Bitstamp today because customers apparently can’t get their dollars out of Mt. Gox. So they pay extra for bitcoins. For those customers, a Mt. Gox bitcoin is different from one anywhere else. So the Mt. Gox price isn’t a clean measure of a bitcoin’s value. Instead, it measures the value of a bitcoin plus the desperation of Mt. Gox’s customers. But that still leaves a puzzle. It makes sense that customers will pay a premium to get their money out. But who is willing to take the other side of the trade, selling bitcoins in return for “Mt. Gox dollars”? As best as I can tell, those traders have stayed silent on the bitcoin chat boards. Perhaps they are newcomers who think they’ve found an arbitrage opportunity and don’t realize their dollars will be hard to withdraw. Or perhaps they believe that Mt. Gox will get its act together. (A more sinister take, raised on the boards, is that some preferred traders do have the ability to withdraw.) Whatever the case, they stand to make a tidy profit if they can get their dollars out, and sorely disappointed if they can’t. Sources: For a quick explanation of bitcoin, try this introduction. For price data from numerous exchanges, visit bitcoin charts. My chart uses a 7-day moving average of spreads to smooth the volatility. The measured spread has at times been much higher, e.g., 40%+ on April 10, but that passed quickly. Disclosure: I own 0.1 bitcoin. Summary: Citigroup securities are still violating the law of one price. Later this week, Citigroup will finally launch its offer to convert some preferred stock into common stock. That exchange has big implications for the government, which purchased preferred shares through the TARP program; after the exchange, the government will become Citi’s largest shareholder. The exchange also has big implications for investors. As I noted two weeks ago, there have been some anomalies in the pricing of Citigroup securities. Those anomalies have gotten smaller, but they are still with us. Citigroup is still violating the law of one price.